The damage caused by Poland’s inland waterways programme will be irreversible and impossible to compensate for. It will also disrupt much of the work that Rewilding Europe and its partners have carried out to date in the Oder Delta. In 2016, the government of Poland published a programme for the development of the country’s inland waterways. With the aim of transforming the Oder, Vistula and Bug rivers into class V waterways (capable of transporting vessels over 1500 tonnes), it would involve major engineering works on the Oder, the construction of a succession of reservoirs on the lower Vistula, the construction of a canal in the Silesia region, and the canalisation of the Bug. The total cost of these measures is estimated to be around 19 billion euros. While the programme is now undergoing feasiblity studies, the Polish government is already moving forward with individual projects which are part of the general waterways blueprint, such as a second dam on the Vistula and various reservoir projects. Large parts of the Oder and the Vistula river valleys are protected as Natura 2000 sites. The Oder and the Vistula are among Europe’s last near-natural rivers and large parts of their valleys are protected as Natura 2000 sites. Upgrading these rivers to Class V status (if possible) will demand radical hydro-engineering efforts. 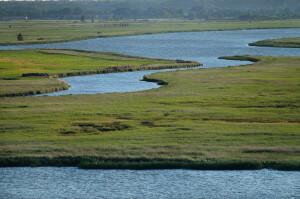 Unsurprisingly, such massive disruption of natural hydrological processes will lead to the widespread destruction of habitats and ecosystems, including areas such as the Oder Delta where Rewilding Europe and its partners have been working hard to protect and restore wild nature, encourage wildlife comeback and develop nature-based economies. From a legal perspective, many projects will violate the European Commission’s Habitats and Birds Directives. 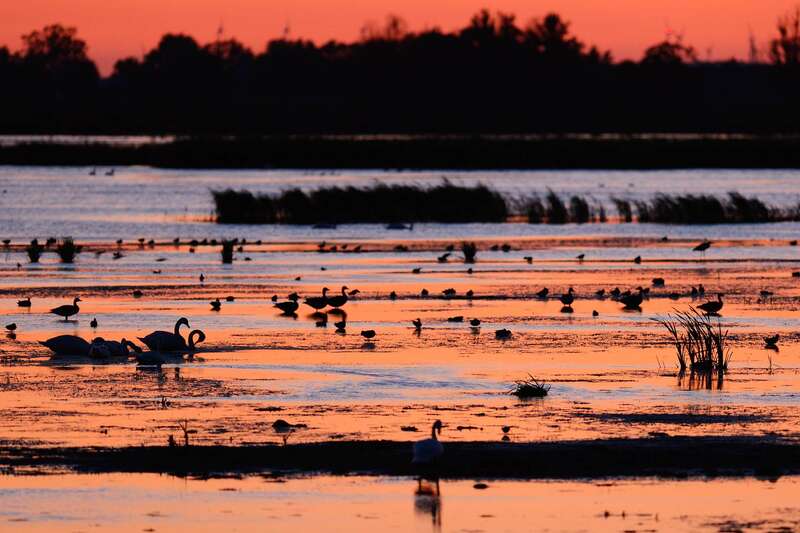 “If it were to go ahead, this project would drastically alter the physiognomy of the delta, with a hugely negative impact on habitats, wildlife, ecosystems and local livelihoods,” says Frans Schepers, Rewilding Europe’s Managing Director. “This would naturally disrupt much of the work that Rewilding Europe and its partners have carried out to date. 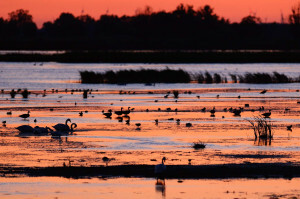 Mute swan, waterfowl, ducks and swans in the Oder Delta rewilding area on the border between Germany and Poland. As a group of researchers from the University of Warsaw’s Faculty of Biology recently concluded, the damage caused by Poland’s inland waterways programme will be irreversible and impossible to compensate for. 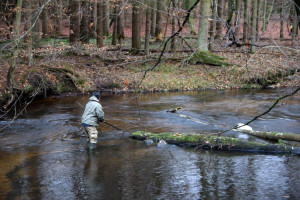 The programme would lead to the loss of one of Europe’s largest riparian forest complexes (on the Oder), two of Europe’s last relatively natural large river valleys, and the uniquely wild Miedzyodrze (a marshy area between two branches of the Oder). 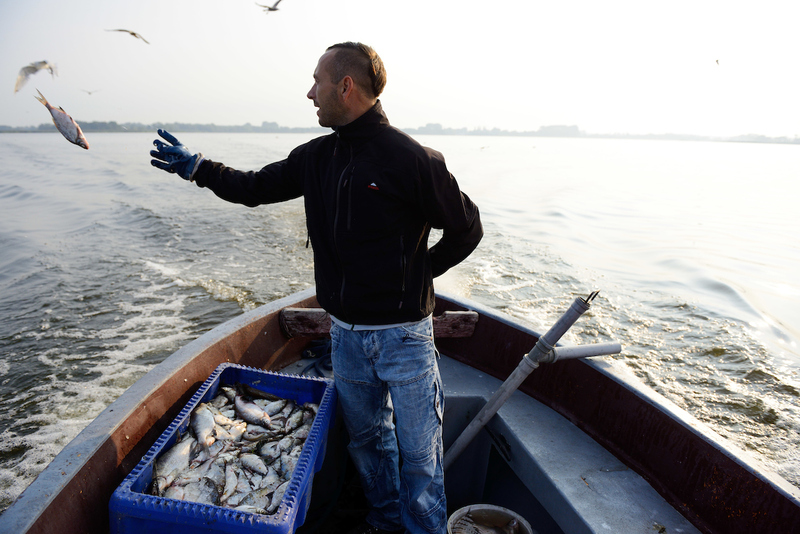 It will also put an end to efforts to reintroduce salmon and sturgeon in the delta, and exacerbate the problem of nitrate pollution in the Baltic Sea. If implemented, Poland’s inland waterways programme would reduce the ability of the rivers involved to clean themselves. This would negatively impact fish stocks, fish-eating bird species and tourism. 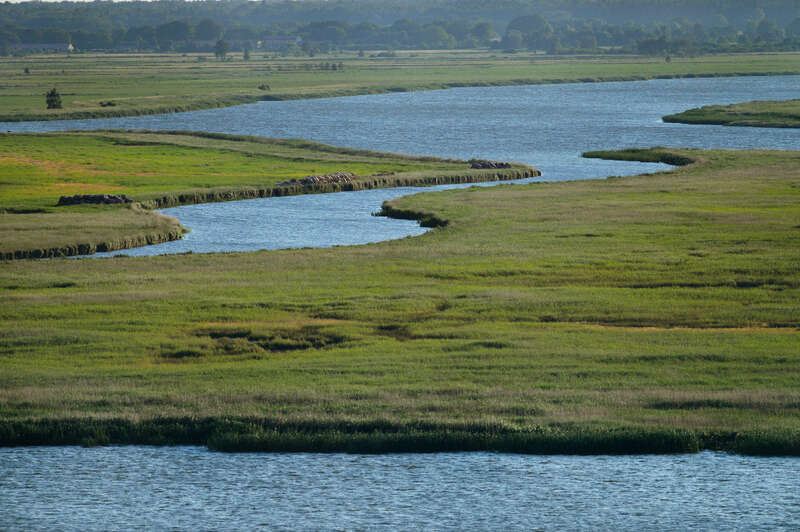 “At the moment the main channel of the Oder is free from barriers to fish migration for about 500 kilometres up from the Baltic,” explains Artur Furdyna, a fish ecologist and river specialist with the Rewilding Oder Delta team. In line with the objectives of the inland waterways programme, the previous Polish government also signed a loan deal with the World Bank to finance the “Oder-Vistula Flood Management Project”, which involves regulation of the Oder and hydro-engineering work on the Vistula. Costing more than 1.3 billion US$, the project will be largely funded by loans from the International Bank for Reconstruction and Development (504 million US$), the Council of Europe Development Bank (329 million US$), and a subsidy from the European Union (219 million US$). 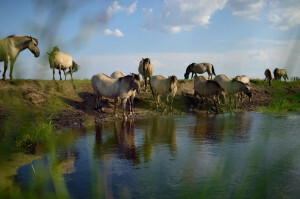 Wild konik horses in the Oder Delta rewilding area. The words “flood management” may be involved in the title of this project, but it is clear that the measures it entails, which would also be hugely damaging from an environmental perspective, are more about creating navigable waterways than flood protection. Many experts have expressed the opinion that this project is more likely to increase, rather than decrease, the risk of flooding. “There is still a lot of uncertainty over what the objectives of this project are, and whether the proposed measures will have the required outcomes,” says Bram Evers, a hydroengineer with Dutch engineering consultancy Royal HaskoningDHV who visited the Oder Delta in April this year. 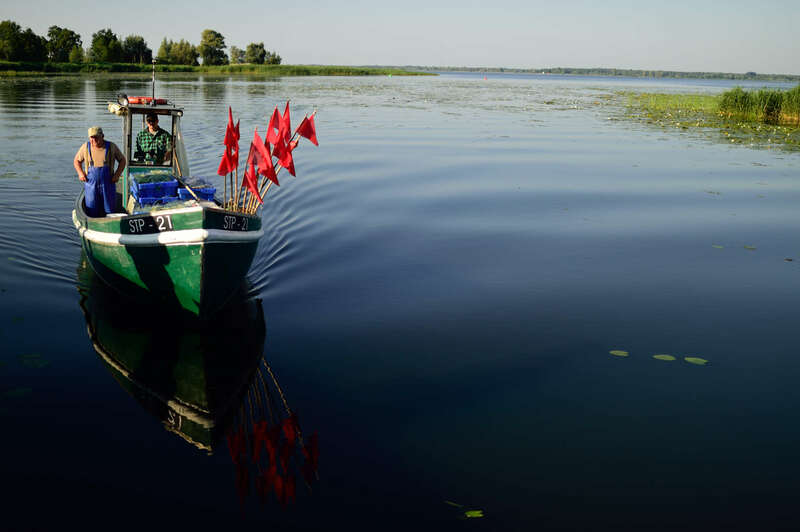 Even the economic incentives involved in the large-scale manipulation of Poland’s inland waterways are unclear. In 2014, the total amount of domestic cargo transported on Polish rivers was just 4.8 million tonnes; this represents 0.4% of the total amount of cargo transported in Poland that year. As a result of the proposed hydro-engineering, the Polish government claims that by 2020, 20 million tonnes of cargo will be carried on the Oder, and nearly 8 million tonnes on the Vistula. Even if these figures are achievable (which is far from certain), this volume of cargo could easily be transported by Poland’s railway system, which is both green and fast, and has the spare capacity. It has already been proven that large dams and large-scale river hydro-engineering are massively damaging to aquatic habitat, contributing substantially to the destruction of fisheries, the extinction of species (particularly marshland and riverine species), and the overall loss of ecosystem services on which the human economy depends. Poland’s proposed inland waterways programme is no different. 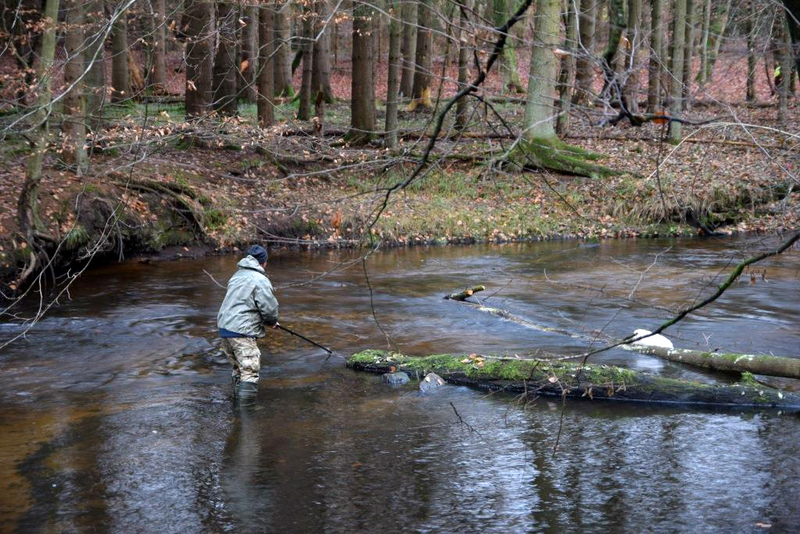 For over 20 years, Artur Furdyna, a fish ecologist and specialist on river and wetland restoration, has been safeguarding fish populations in Poland. Artur Furdyna is a leading member of Koalicja Raturjmy Rzeki (Save the River Coalition), a recently formed partnership of over 20 NGOs, including WWF Poland, working to fight implementation of the inland waterways programme. “We are trying to open people’s eyes to the real effects of the plan,” he says. “At the same time, we are also talking to decision makers, during conferences and through other means of communication. Our main goal is to stop this potentially devastating plan. Rewilding Europe supports the opposition of Poland’s inland waterways programme, and calls on all those funding this programme to reconsider their support for this ill-conceived intervention. We are confident that further research, which is now essential, will not only highlight the programme’s hugely damaging impact, both on the environment and on the people living along these highly valuable waterways, but also its severe technical and economic drawbacks. To learn more about Poland’s inland waterways programme, please visit this page. Learn more about the work of Rewilding Europe and partners in the Oder Delta here.